Blue flowers are hard to find in the garden -- most lean toward purple hues. However, Evolvulus glomeratus "Blue Daze" is aptly named: The low-growing, herbaceous perennial features true-blue flowers that stand out against the attractive, olive-green leaves. Perfect for borders or containers, "Blue Daze" blooms all summer long when cared for properly. "Blue Daze" is a warmth-loving plant. It is hardy in U.S. Department of Agriculture plant hardiness zones 8 through 11. 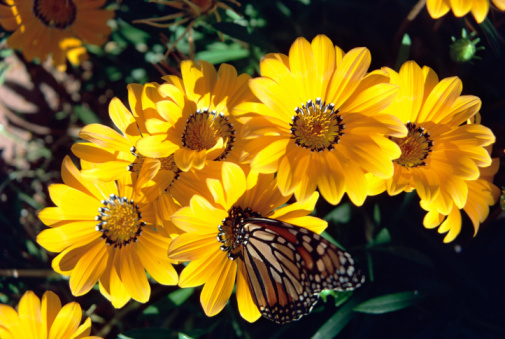 In cooler climates, it is often grown as an annual or in a container that is brought indoors for the winter. Situate this plant where it will stay nice and warm. In fact, if you have a hot spot in your garden where other plants wilt, replace those plants with this flower -- "Blue Daze" likes it hot. It can even tolerate salty conditions, so if you're near the coast, plant this flower in a hanging container and watch it withstand the salty air. Most outdoor plants die at the first hint of freezing temperatures, so bring container plants indoors well before cool fall temperatures arise. Some "Blue Daze" plants can tolerate a light frost if they are surrounded by a thick layer of mulch. 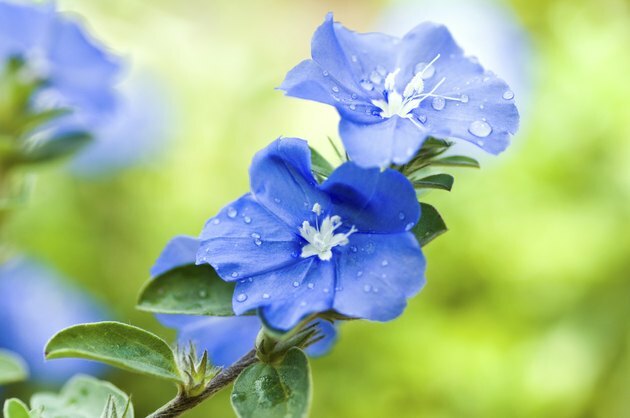 For "Blue Daze" to bloom properly, it needs full sunlight. Each flower opens for only one day, but it is replaced by a new flower the next day. If the day is cloudy or the plant is shaded, the flower won't open and its brief life is wasted. Locate these plants -- including those grown in containers -- where they will get as much hot, direct sunlight as possible. As far as soil goes, "Blue Daze" tolerates a range of soils, including poor or sandy soil, as long as it is well drained. If you bring a container indoors for the winter, locate it in bright but indirect sunlight and in a cool location. Because "Blue Daze" is such a prolific bloomer, it benefits from monthly applications of fertilizer during the growing season. Use a bloom-boosting 15-30-15 formulation, water-soluble fertilizer once a month, following the instructions for application on the package. These instructions vary depending on the brand, but in general, dilute 1 tablespoon of the fertilizer in 1 gallon of water and use this solution to water your plants. Because "Blue Daze" thrives in full, hot sunlight, it needs frequent watering. Water when the surface of the soil feels dry to the touch and frequently enough so that the soil is almost continually but barely moist. In the winter, they need little watering. "Blue Daze" is a hardy plant. It does not suffer from serious pest or disease problems. The one thing it cannot tolerate is soggy soil. Extended periods of rain cause fungal problems to develop in the soil, which quickly destroy the shallow roots of the plant. Overwatering leads to the same result, as does poorly drained soils. Plants grown in containers should have drainage holes in the base to prevent this problem, and home gardeners should avoid planting "Blue Daze" in depressions or other locations that tend to collect water.